The Triple Threat- we all have a favorite. At a conference two years ago, I was introduced to a company called The Greater Knead. At that time, they had bagels which were Top 8 free. Yes, Top 8 free bagels. This was like a unicorn to us! My son had never had such a thing, but that changed shortly after that conference. Based on the East Coast, just outside Philadelphia, we were able to order from them, and he was in love! We’ve been following the company since then, and they introduced something last year that truly has been a snacking life-saver for us! Bagel chips. They come both in small plastic cups (individual servings) as well as by the bag. We really like the cups for on-the-go, because they don’t get smashed into bagel dust. We ordered the variety pack about six weeks ago. It includes plain, cinnamon raisin, and “everything.” Each one of the TealKids has a favorite, so it works out well to order the variety. Now here’s my confession, I HATE raisins. Always have. I believe it has caused my trust issues with the giant oatmeal cookies we used to get at Quaker Square in Akron, Ohio. Soft, warm, fresh from the oven cookies… with one small, brownish dot in the middle. I saved that bite for last and to my surprise, it was NOT a chocolate chip. 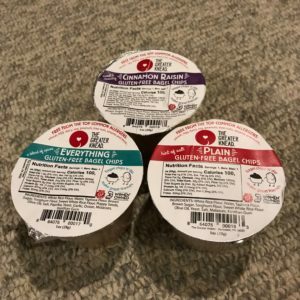 So we each have the one we prefer and love to pack them together with Sunbutter on the go cups for the perfect for us snack combo. We finally went on a long planned and anticipated family vacation in the last week of June, to Philadelphia. When I remembered that The Greater Knead was in the area, I reached out to Michelle Carfagno, the business owner, and asked if they would let us come by to see how this favorite snack of ours was made. She was gracious enough to invite us to take a look at the operation, and what an operation it is! We got there and were introduced to both Michelle and her food scientist and head of R&D, Mengyi Hu, and thanked them both for creating the awesome bagels and bagel chips we have come to love. They were in packaging mode the day we were there. We got to see where the manufacturing takes place, and all the machines it takes to make both the bagels and the bagel chips. It was so fun to see how those little disks are formed, and the bagels rolled. Next was on to the baking area. Michelle showed us the newer and older machines. She has been adding bigger machines with more capacity as the years have gone on. One of the mixers held about 10 lbs. of flour, while the newer one holds 200 lbs. Same with the ovens. She has been able to increase the number of trays that are baked several times over. Last was on to the packaging area of the facility, where the staff were hard at work measuring, sealing, and packing up cartons to head out into the world to be enjoyed by many. These are mixer attachments if you can believe it. 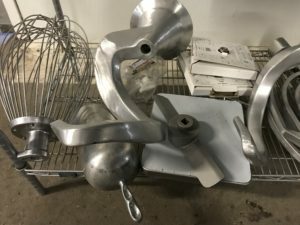 Have you ever seen such a big dough hook? Michelle’s commitment to the allergy community is strong, and she gets it because she lives it. She started the bakery because of her love of baking, and her desire to make products for her family (two of whom were diagnosed with Celiac disease at the time), and has since developed food issues herself. She has had offers from other companies to work together in her facility, but if they are not allergy-aware and gluten and Top 8 free, she’s not interested. She wants to be sure the environment is controlled, to keep families like ours safe, and we sure appreciate that. Another thing we were very happy to show our kids, especially TealGirl, is that it is a woman-run business. TealGirl was impressed, and it’s important for us that she sees that hard work and commitment can make any dream come true. One of our favorite ways to enjoy-match made in allergy heaven (for our family). We thank you, Michelle, for the products you make, and for your commitment to the allergy community. Oh, and remember when I mentioned the bagel chips pairing well with Sunbutter? You should be on the lookout for that official combo coming out in the fall! It was unveiled at the Fancy Food Show in early July. 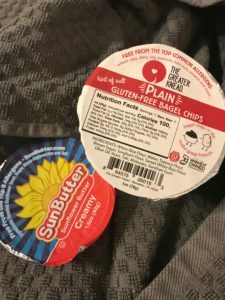 I’m so happy to see two favorites teaming up for snacking ease for those with allergies and Celiac disease. You can read about another visit we had to a product we love here.